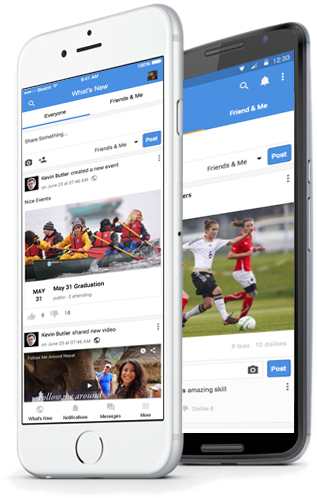 Mobile Apps are essential and necessary for the success of any online social networks.Our white label Android and iOS apps - as extensions of mooSocial - will bring yoursocial network closer than ever, just a “fingertip” away to your customers. It is critical for each online social network to incorporate a Mobile Solution to increase user engagements and build brand awareness. Our Android and iOS apps will enable your social network to standout from competitions by providing necessary added value. Our mobile apps will help cultivate loyalty by staying closer to your customers and being visible for them at all times. Realtime text messages guarantee to be seen that are sent directly to the user’s mobile display screen. Providing users instant update of community’s activities and other members’ interactions. It is an important “Immediate Engagement” feature of the App. Our Social App can easily support multilingual or non-english online communities with its ability to be translated into another language. It is capable of display in different languages based on users’s preference so there is no need to deploy multiple apps. Enhancing user’s experience with mobile’s native features. Native features such as swipe gesture, file upload, camera capture and push notifications will keep users engaged and enjoy using Social App. REST API library is included and is powering our Social Apps. It is the necessary building blocks which allow developing and extending Social Apps’ functionalities much easier. Admin can send mass push notification messages to all Social App users. It is the realtime “bulk mail” feature to provide your users with urgent information, promotions or anything which require users’ immediate attention. Message can be sent with or without backlink. Monetize your community with AdMob. Our Social App is integrated “out of the box” with AdMob to allow community owners to earn revenue from their investments. It is capable of serving both full-screen and or banner (bottom) Ads for in-app monetization. * mooSocial Core is required for Social Apps to function. * Install required REST API Library and Social App Plugin on your site.